The Italian Sea Group has launched its latest yacht with the 47-metre Admiral Maxima, Entourage, splashing in Marina di Carrara, Italy. 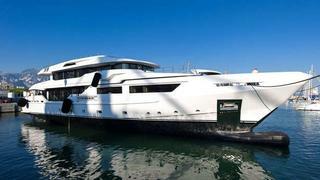 Christened Entourage, the full-displacement tri-deck yacht has a steel hull and aluminium superstructure. Luca Dini is responsible for the exterior styling of the new yacht, in collaboration with Admiral Centro Stile and Baldo Gjurasic, the owner's representative and project manager. The Maxima 47 features full-height panoramic windows to flood the main saloon with natural light and offer excellent vistas. The entire main deck is spacious, with full-height sliding doors on either side of the main saloon. Forward on this deck is the master suite, which comprises a master stateroom with a king size bed, a private owner's gym and sauna, spacious master bathroom, walk-in wardrobes and a dedicated owner's office. Belowdecks are the guest accommodations, with four guest staterooms comprising two VIP and two double berth cabins that can convert two twin or triple beds when required. All of the guest staterooms have en suite bathrooms. The huge sun deck is a prime location for entertaining, partially shaded by a hardtop and hosting a bar, large Jacuzzi, table for al fresco dining and lounging areas. Entourage is designed for passage making, capable of a range of 6,000-plus nautical miles. She follows the launch of four other major superyachts for the Italian Sea Group this year, including the 35m fully custom Admiral yacht Foam, 40m Tecnomar Nadara yacht Low Profile, 45m Admiral Regale series yacht Flying Dragon and the Admiral Impero 37m Nono. Entourage will be making her debut at the Monaco Yacht Show this September, and she will also be on display at the Fort Lauderdale Boat Show.